Also, a new expansion has been announced. 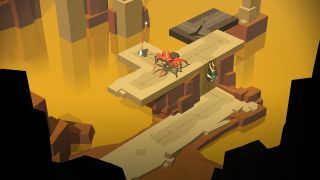 Technically, Lara Croft Go (or Lara Croft GO, to give it its actual title, which sounds like you're yelling at her to cross the road after the green man appears) has been on PC since late last year. However, as that was the Windows Store, and as nobody uses the Windows Store, it doesn't really count. Now, Lara 'Chuckles' Croft's puzzley spin-off has finally arrived on Steam, along with news of some doppelganger DLC that will allow for some of that trendy 'single-player co-op'. Firstly, here's Crofty on Steam, along with a 20% discount if you snaffle GO within the next few days. And here's a trailer for its just announced (and, if you've a PlayStation, just released) Mirror of Spirits DLC, which we'll have to wait until March for on PC, because exclusivity. In return for our patience, there'll be some new levels when Mirror of Spirits appears on Personal Computers sometime in March. Interestingly, it's been developed by GNOG developer KO-OP mode, and it's nice to see an indie being given the reigns to an expansion like that.